Apocalypses were predicted and are predicted quite often, not materialized, so most people don’t take them seriously. Some even take the prediction task as a way of socializing. The field has been broaden substantially when the predictions of human induced cataclysms were added to natural ones - it became a sort of science, almost. If you are for some serious reading, visit the website of Nick Bostrom. Man made doomsday aside, what is the current probability of a natural one? The graph below, where the time scale encompasses hundreds of millions of years, gives a false sense of security because human life span is so insignificant on that scale. 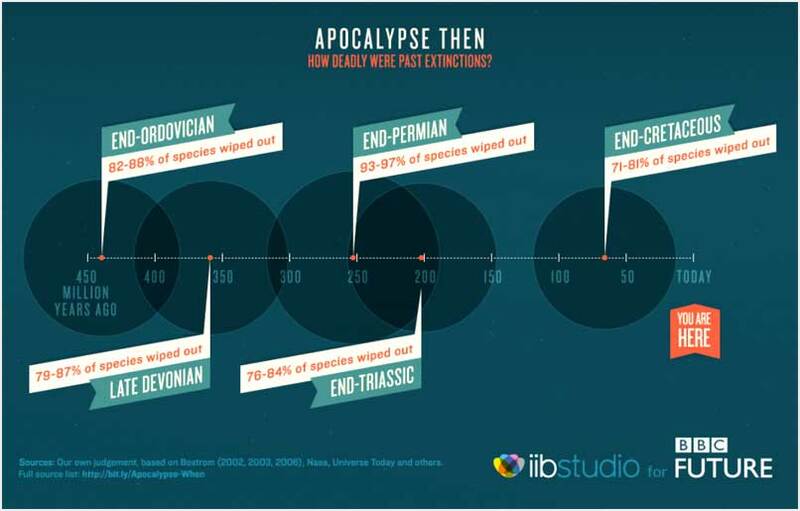 But, look more studiously: the five near-total extinctions of live species in the last 440 million years are unevenly spaced, from 52 to 142 million years apart, the last one (end-cretaceous) 68 million years ago. We are in the range, aren’t we?